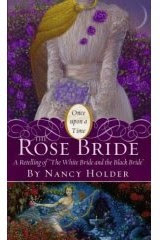 I've read several of Nancy Holder's books and she is usually very good at telling classic fairy tales in new and interesting ways. While I still liked the basic story of this particular book, it just wasn't my favorite fairy tale. The book concentrated on grief and the sorrow of human loss. It showed that although grief can destroy and harden a person, it can also lift and teach someone how to love deeper. The book's main theme seemed to be that not any love, but true love is the greatest lesson anyone can learn, and when it is learned it can conquer all. I think that this is a great message and that everyone should strive to love with a perfect and godlike love, but I didn't like the way the message was presented. It was incorporated into every page and every paragraph. There was no chance to think about the message. It was just too much. Celestine wants nothing more for her daughter Rose than for her to know that she is loved. So when Celestine prays to her patron goddess Artemis and asks for this gift to be bestowed upon her only daughter, Artemis grants her wish. Soon, everyone that Rose has ever loved is taken away from her, a nd the only "comforts" she has left in the world are her mother's garden and Ombrine, the stepmother she has never met. In true fairy tale fashion Ombrine is a wicked stepmother who uses sorcery to fullfill her desires and puts Rose to work in her own home. When Rose is invited to meet the king, Ombrine decides that Rose is no longer useful and hatches a plan to get rid of Rose and put her daughter Desiree in Rose's place. To stop Ombrine and protect the kingdom, Rose must learn the true meaning of love.